In the mid-1800s western Pennsylvania was a popular route for escaped slaves traveling the Underground Railroad. Towns like Uniontown and Washington, Pennsylvania, were important stops as slaves escaped Virginia. After leaving these towns, many of these escaped slaves would make their way into Indiana County, Pennsylvania. The most popular stop on their route through Indiana County was the borough of Blairsville. Sitting just across the Conemaugh River from Westmoreland County, Blairsville was in a perfect location to help slaves escape further north. Combine that with the strong abolitionist movement in the area, and it’s no surprise that many former slaves found their way to this small borough. Today, the best place to learn about Blairsville’s role in the Underground Railroad is at the Underground Railroad History Center. 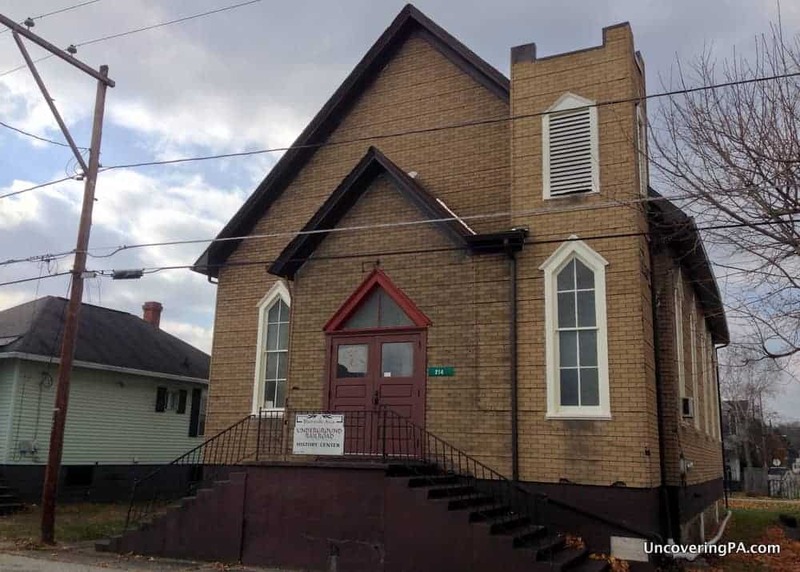 Housed in the former Second Baptist Church, the oldest African-American building in the town, the history center tells two different stories related to the Underground Railroad. 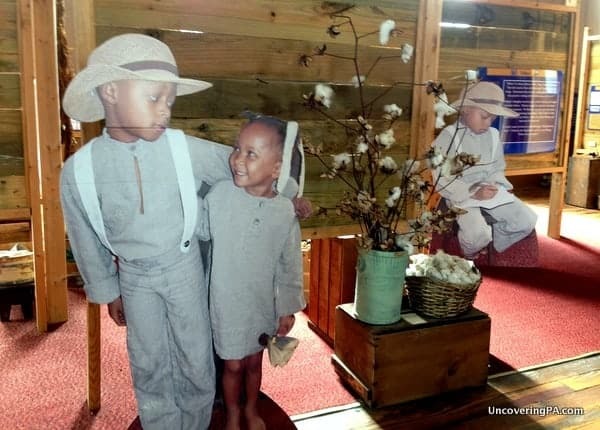 A cotton picking interactive exhibit to show children what it was like to be an enslaved child. The first area tells about the Underground Railroad in Pennsylvania, focusing on Abolitionists in Indiana County, Pennsylvania. Called “Freedom in the Air,” this program is on loan from the Indiana County Historical Society, and gives visitors the chance to learn more about the people of Indiana County who helped secure freedom for many slaves coming through the area. The second section is, in my opinion, the more interesting of the two. This area details what life was like as a child born into slavery. 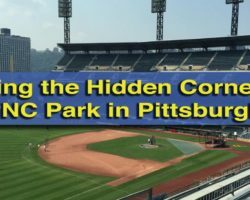 The area is clearly geared toward children, but provides an interesting perspective that I hadn’t heard much about in the past. As you walk through the life of an enslaved child, there is both signage and interactive exhibits that teach you about the chores children did, and the types of conditions they lived in. It’s really sobering to think of fun-loving children being enslaved and forced to work all day. However, the information is presented in a way that’s appropriate for children and does a good job of starting the discussion of slavery with young boys and girls. The interior of the Underground Railroad History Center in Blairsville, PA. 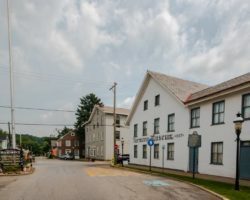 Available at several places around town, including the Blairsville Historical Society, this guide provides nearly two dozen destinations connected with the Underground Railroad throughout the southern half of Indiana County. While you can’t go inside most of the homes in the guide, driving past and thinking about the history of the homes is certainly fascinating. 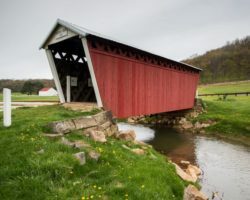 Blairsville and the rest of Indiana County, Pennsylvania, might not be the most well-known destinations in Pennsylvania to learn about the Underground Railroad. However, the amazing amount of history in the county makes this a worthwhile stop for anyone wanting to learn about this fascinating piece of US history. And, while the Underground Railroad History Center might be small, it’s especially good for anyone wanting to start the discussion of slavery with their children. 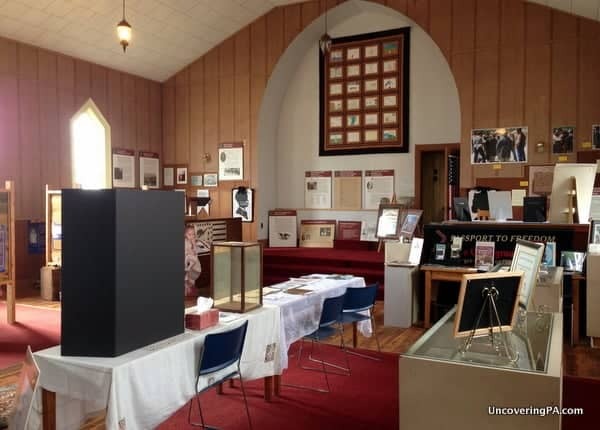 It’s worth noting that you’ll need to plan ahead to visit the Underground Railroad History Center in Blairsville, Pennsylvania. 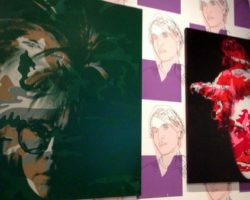 The museum is open by appointment only from May – October. There are no regular operating hours at the center. It is recommended that you schedule your appointment at least a week before you want to visit, if at all possible (though there’s no harm in calling if you only have a day or two notice). Appointments to visit the Underground Railroad History Center can be made by calling 724-459-5779. The charge for a tour of the center is $3 per person. Note: My visit to the Underground Railroad History Center was hosted by the Indiana County Visitor Bureau. However, the opinions expressed are my own. Explore more of the region’s history at the Saltsburg Historical Society Museum. See note above to make appointment.